Ralph W. Murphy, Sr., Crescent City, passed away July 16, 2018 with his family at his side. Born in South Milwaukee, Wisconsin on August 18, 1923 to Timothy and Meta Murphy, one of eleven children. 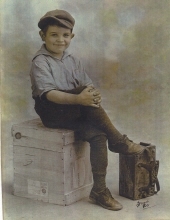 As small child, Ralph had his own shoe shine business during the depression. He helped support his family. A veteran of the Marine Corps, he served during WW II in the Pacific. Ralph married Sylvia Vogelien on June 5, 1954. They lived in Los Angeles until moving to Smith River in 1966 after seeing an ad for employment at Country Maid Dairy. Ralph worked as a dairy worker most of his life. Surviving are his children Ralph Murphy, Jr., Virginia Winn (Michael) and Pauline Byrne. He also leaves behind 8 grandchildren and numerous great grandchildren and a few great great grandchildren. Ralph will be laid to rest with the love of his life Sylvia at Eagle Point National Cemetery on July 31st at 3:00 pm. To plant a tree in memory of Ralph William Murphy Sr, please visit our Tribute Store. "Email Address" would like to share the life celebration of Ralph William Murphy Sr. Click on the "link" to go to share a favorite memory or leave a condolence message for the family.